Car Shopping? Check out this 2013 Fiat 500 Sport for sale Greater Kansas City area! One Owner! FWD 1.4L I4 Leather Seats, CD Stereo w/Aux, Alloy Wheels, 34 MPG, Alpine Audio System, Blue & Me Handsfree Communication, Rear Spoiler, Certified Warranty. Barrels of fun! 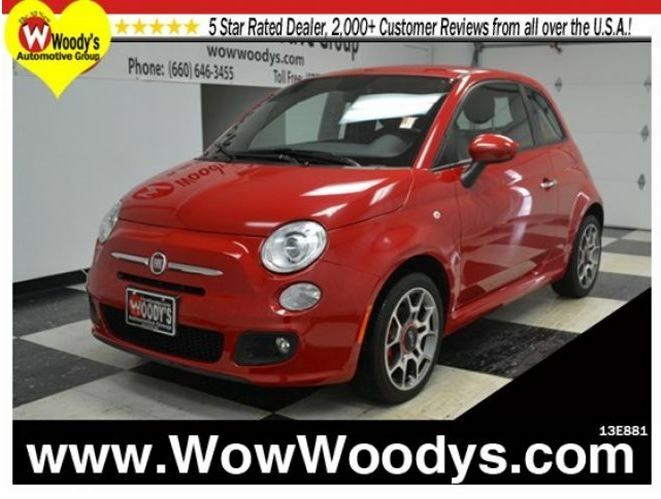 Brings new meaning to the term, ‘joy ride.’How would you like riding home in this beautiful-looking and fun 2013 Fiat 500 at a price like this? Don’t let its size fool you, this 500 has a big appetite for the road. We will pick you up at the airport or ship your vehicle to you! If you’d like more information about this luxurious used Fiat 500 our huge selection of other used Fiat or 700+ vehicles located near Kansas City please visit our website and provide us with your contact information. One of our empowered Woody’s Automotive Group Sales Advisors will contact you promptly.